Chimpanzee Tea Party: Running Update... #3? I ran outside for the first time since last Monday (i.e. 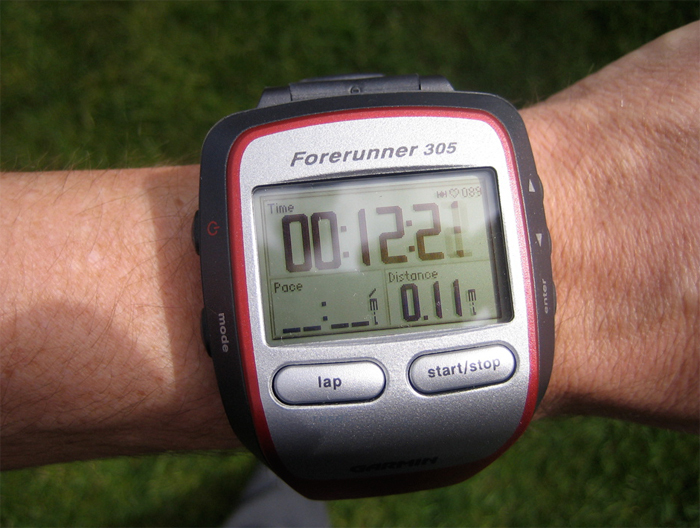 my first day running) yesterday, and borrowed my coworker Glen's GPS watch thing for it. It's really pretty neat. One of the things I have liked about the elliptical machine is all the feedback it gives you regarding pace and distance and whatnot... something the GPS gives you as well, but you get to be out in the sunshine and scenery instead of a dank exercise room staring at a wall. It seems to me that this will serve as really good motivation, as already this has proven true with the elliptical's feedback. Additionally, having access to all those variables from my training on my computer and being able to graph it really speaks to my inner geek. Also, it seems harder to spend $215(plus s&h) on a GPS watch and then have it gather dust on my shelf... well, maybe not, but gadgets make everything more fun. So it looks like I'm in the market for "GPS Fitness Computer" as the adverts say. The Forerunner 305 is what I'm looking at right now, because I think I want a heart rate monitor... but I'm going to try one of the lab's today to make sure it's not too uncomfortable. The 301 is a bunch cheaper, but not nearly as pretty... oh and some people have trouble with the HR monitor. I'm not really sure what features aren't shared between the two, and have to do more research to really decide... and it may be that I really don't want a HR monitor. Now, as far as actual exercise... I was able to do 3 miles on Friday on the elliptical (Level 4) at about a 10:30 pace (which seems to be where I'm at right now), but I didn't do anything over the weekend and was lazy on Monday, so I could only do 2 miles on Tuesday (Level 5 though). As I said above, I ran outside on Wednesday and got in 2 miles again at that same 10:30-11 minute mile pace but I walked some... GPS watch saying I did about 22 minutes of work with 5 minutes of rest interspersed. I was thinking I was going to do the elliptical today, but it's supposed to be 50 degrees, so maybe I'll run outside with the HR monitor to see how it goes. UPDATE: The other option I looked at during lunch was Polar heart rate monitors with an accelerometer you put on your shoe. The advantage of those is that they work indoors, so you can still track your workouts even when it is winter or raining or whatever. The downsides being that it appears less accurate and more prone to errors. One of the reasons I wanted a heart rate monitor was to track indoor work outs even without pace/distance(and keep it with my other workouts)... but it also appears that you can get a "Foot Pod" for the Forerunner 305 (but not the 301 unfortunately). So far all reviews are pointing to the 305 mainly for the better HR monitor and much better GPS performance, but it doesn't appear to have many/features that the 301 doesn't.